ECM-mediated feedback loops during fibrosis initiation and progression. (Upper) Tissue injury leads to TGF-β activation and downstream canonical and noncanonical signals that initiate fibrosis. Once initiated, fibrosis can progress in the absence of the initial stimulus. 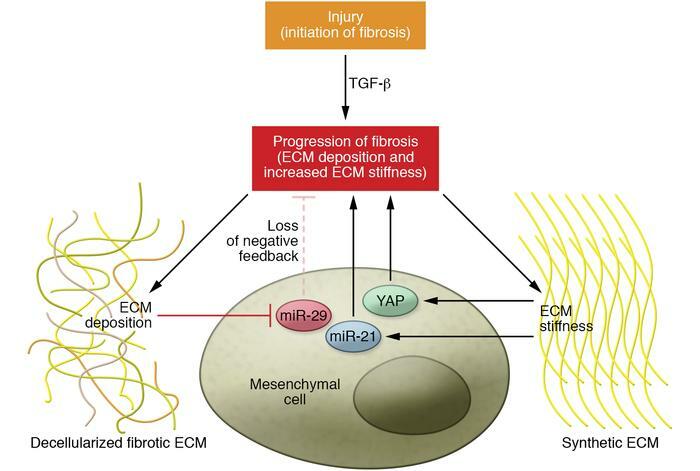 (Lower) The fibrotic ECM can suppress miR-29, a master negative regulator of stromal genes. This results in increased ribosome recruitment to hundreds of stromal genes and sustained deposition of ECM, thus constituting a positive-feedback loop. Increased matrix stiffness activates the Hippo pathway effector Yes-associated protein 1 (YAP), which can drive ECM deposition and matrix stiffening, constituting another positive-feedback loop. Mesenchymal progenitor cell mechanical memory of substratum stiffness is mediated by miR-21, allowing these progenitors to stably maintain their fibrogenic phenotype and further stiffen the ECM.